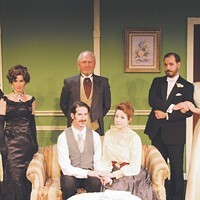 THEATER—CTC launches its new season with a staging of Oscar Wilde's 1895 classic, An Ideal Husband. Blackmail, scandal, and political indiscretions are only a few of the issues facing the characters in this classic comedy of manners. Prepare to laugh at how ridiculous the aristocracy could be. 7:30pm. Cascades Theatrical Company, 148 NW Greenwood Ave. $13-$20. REGGAE—Mike Love's unique brand of roots rock reggae is bound to please the most strident fan of the genre. His songs flit between acoustic, electric and rock, while keeping his message of peace and unity prevalent throughout. He just wants to change the world one song at a time. 9pm. Volcanic Theatre Pub, 70 SW Century Dr. $8 adv., $10 door. FOOD—Come on out and sample nearly all of Sisters' restaurants' fare in one place, while enjoying Beatles tunes courtesy of Juju Eyeball and entertainment by Central Oregon Aerial Arts. All proceeds benefit the Sisters Kiwanis Food Bank and the Furry Friends Foundation. 6 pm. 223 E Hood Ave., Sisters. $15-$50 sliding scale. BIKE—For eight years Jamie Bianchini traveled solo on a tandem bike across 81 countries picking up strangers (soon friends) on his way. This evening will include an outdoor multi-media slideshow by Jamie and his wife, Christina, who he met in his travels, plus a happy hour. 6 pm. Crow's Feet Commons, 875 NW Brooks St. Free. WINE—Head on out to Sunriver to enjoy comedy by Laurie Forster, aka The Stand-up Sommelier, and music by On the Rocks, Honey Don't, and Yvonne Ramage, along with wine from over a dozen Oregon wineries. There will also be food vendors and an educational wine class by Forster. Friday 3-8 pm Friday, Saturday noon-6 pm. SHARC Amphitheater, 57250 Overlook Rd., Sunriver. $18-$23. FESTIVAL—Come for the Bavarian style music, beer, wine, food and cider, but stay for the wiener dogs struggling to move those tiny legs toward the finish line in the Weiner Dog races. Eat all the bratwurst (from Taylor's) you can while washing it down with seasonal ales from Bend Brewing, Crux, Cascade Lakes, Deschutes, Cascade Lakes, and many more. Friday: 5-10pm, Saturday: noon-10pm. Oregon Ave.
CELEBRATE—The final Pickin' & Paddlin' of 2015 coincides with the potential opening day of the Bend Whitewater Park. The joyful celebrations will be accompanied by the bluegrass sounds of Portland's Renegade String Band, a five-piece, up-tempo ensemble. 4 pm. Tumalo Creek Kayak & Canoe, 805 SW Industrial Way Suite 6. $10. DANCE—Starting in Seattle and expanding throughout the West Coast, the goal of Dance Yourself Clean is to keep things simple and fun. Combining lasers, fog machines, and music from bands such as LCD Soundsystem, Miike Snow, Phantogram, and much more, this unpretentious dance party is a recipe for a good time. 9 pm. Domino Room, 51 NW Greenwood Ave. $15 adv., $20 door. CONCERT—The Portland Gay Men's Chorus returns to Bend in connection with PFLAG, GSA, and The Human Dignity Coalition. While the music of ABBA can be seen as campy, the towering talent of The Chorus reimagines the songs in ways surprising and gorgeous. Get tickets in advance because the show will sell out. 7pm. First Presbyterian Church, 230 NE Ninth St. $15-$20. CARS—Feeling the need for speed? Then you'll be in great company at the 20th anniversary celebration of the Oregon Festival of Cars. The need for speed is this year's theme, and they'll be Ferraris, Porsches, Lamborghinis, Corvettes, and all sorts of other modified and racecars to drool over. 10-3 pm. Broken Top Club, 62000 Broken Top Dr. $5.